Wright State University senior guard Mackenzie Taylor (12) was voted to the All-Horizon League first team. The league champion Raiders take on Texas A&M at 4:30 p.m. Friday, March 22 in the opening round of the NCAA Women’s college basketball tournament. 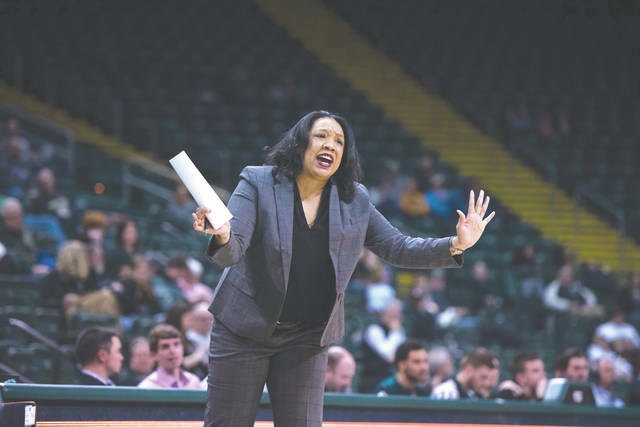 WSU women’s basketball Head Coach Katrina Merriweather was named Horizon League Coach of the Year after guiding the Raiders to the league title this season. 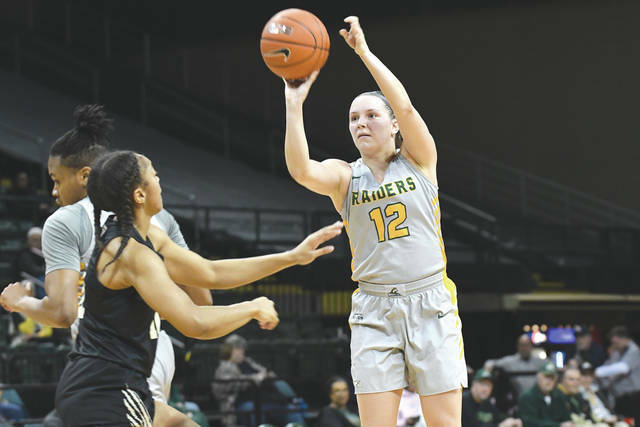 GREENE COUNTY — The Wright State University women’s basketball team will take on host Texas A&M at 4:30 p.m. in the first round of the 2019 NCAA Divison I Women’s Basketball Championship, in College Station, Texas. WSU Raider fans are invited to cheer on the team at a tournament gathering at Milano’s Beavercreek, located at 2260 Fairfield Road inside the Fairfield Place Shopping Center, to watch the game. The Raiders (27-6) earned their tournament berth and No. 13 seed after winning the Horizon League tournament and becoming an automatic qualifier. Their entrance into the tournament will only be the second time in program history that the Raiders have made an appearance in the NCAA March Madness Tournament, the first coming in the 2013-14 season. The Raiders earned the top-seed in the Horizon League Tournament after taking the regular-season title with a 13-2 regular season in the conference. WSU defeated Oakland, Indiana University Purdue University Indianapolis, and Green Bay along the way to their second title in program history. WSU also received a vote in the final regular season Associated Press Top 25 Poll for just the second time in program history. The Raiders have been guided to the March Madness Tournament by Head Coach Katrina Merriweather, who is in her third year and has a career record of 75-26 at the helm. Merriweather was named the Horizon League Coach of the Year for the second time in three years earlier in March. Besides the COY honor, Mackenzie Taylor was selected to the first team, Symone Simmons to the second team, Angel Baker to the Freshman Team and Emily Vogelpohl to the Defensive Team. Taylor and Vogelpohl were named to the Horizon League All-Tournament Team as Michal Miller was selected as the MVP. On offense, the Raiders are led by Taylor, who averages 11.8 points per game, while Miller is just behind with 11.5 points each outing. Vogelpohl tallies 9.2 ppg, and leads the team in assists (98) and steals (54). On the other end of the court, Wright State relies on the rebounding excellence of Simmons, who is 38th in the country with a 10.0 average. Tyler Frierson averages 7.1 rebounds per game while also adding 6.6 points per game. Frierson also leads the team in blocks with 30 on the season. The Aggies (24-7), ranked No. 14 in the latest AP Top 25 Poll, earned a No.4 NCAA tournament seed as an at-large bid. They finished third in the 14-team Southeastern Conference, and lost to Arkansas in the SEC tournament semifinals. The Aggies are coached by Tony Blair, who has spent 16 seasons on the sidelines for the women’s basketball team and amassed a 381-158 record. This marks the second straight season, and the sixth time in eight years, that Texas A&M has hosted First and Second Round games, and the 11th time in the past 13 seasons that Texas A&M has earned a Top 4-seed in the Big Dance. The Aggies are one of seven schools to have qualified for at least 14 consecutive NCAA Tournaments, joining Baylor, Connecticut, DePaul, Notre Dame, Stanford and Tennessee. Baylor, Connecticut, Stanford and Texas A&M are the only schools of the group who have been seeded sixth-or-higher in all 14 of those seasons. Guard Chennedy Carter, who missed the SEC Tournament with an injury to her hand but is expected to play in the NCAA Tournament, was named to the All-Southeastern Conference First Team for the second consecutive season. Carter is the first player in Texas A&M history to be named first team all-conference in both her freshman and sophomore seasons. For the second consecutive year, Carter led the SEC with 23.4 points per game in conference games. Overall, she ranks ninth nationally with 22.5 points per game, adding 4.5 rebounds and 3.5 assists per contest. No other Aggie was honored by the SEC but three other players average double-digits on offense with Kayla Wells putting in 15.1 points per game, Aaliyah Wilson tallying 13.8 ppg, and Ciera Johnson adding 12.0 ppg. The Aggies’ N’dea Jones currently ranks 10th in the country with 11.5 rebounds per game. Reed Arena also welcomes No. 5-seed Marquette (26-7), an at-large entry out of the Big East Conference, and No. 12-seed Rice (28-3), the automatic qualifier from Conference USA. The winner of that 2 p.m. game faces the Texas A&M-Wright State winner in the Second Round on Sunday, March 24. The winner of the College Station First-and-Second Round site faces the winner of the Notre Dame First-and-Second Round site that features Notre Dame, Central Michigan, Michigan State and Bethune-Cookman in the Chicago Regional on March 30. Information provided by Wright State University Athletics, wsuraiders.com/ .